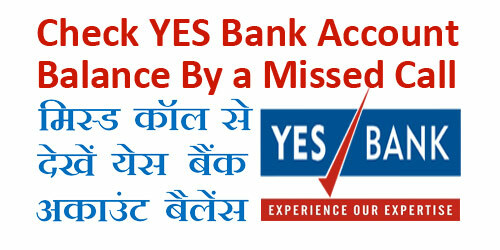 pixel How To Check YES Bank Account Balance/ Mini Statement By Missed Call ? How To Check YES Bank Account Balance/ Mini Statement By Missed Call ? 1.) How To Check Your SBI Account Balance And Statement By Missed Call ? 2.) How To Check Kotak Mahindra Bank Account Balance By Missed Call ? 3.) How To Check AXIS Bank Account Balance/ Mini Statement By Missed Call ? 4.) How To Check ICICI Bank Account Balance / Statement By Missed Call ? 5.) How To Check Union Bank Of India Account Balance By Missed Call ? YESREG <space> Customer ID & Send it to +91-9840909000. Step 2. जो Toll Free Number आपको अपने Registered Mobile Number से Dial करना है, वो यह है - 09223920000. Step 2. जो Toll Free Number आपको अपने Registered Mobile Number से Dial करना है, वो यह है - 09223921111. उम्मीद करते हैं कि अब आप समझ गए होंगे - How To Check YES Bank Account Balance/ Mini Statement By Missed Call.